for a flower to bloom. we could still have some fun." spring will come very soon." on a bed of crochet. That is really pretty. I like the cross stitch combined with the crochet. Such a gentle and delicate project! The rose is beautiful! What are you going to use this for? I was thinking of making a few more and joining them for a lap blanket but now it looks like it is going to be a little cushion. Rose and poem so beautiful! 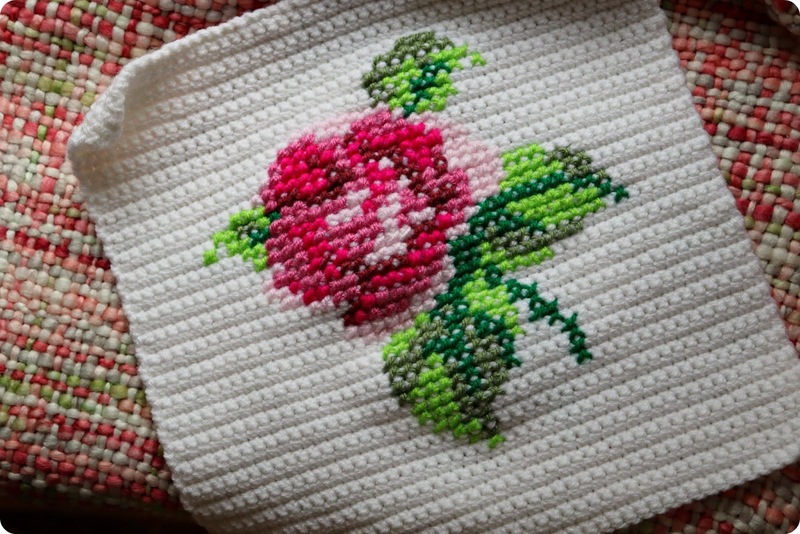 Hello, pretty rose and cross stitch. I love the cute poem. Enjoy your day and weekend! Your handiwork is lovely. Can imagine that block as part of a beautiful throw. Thanks, Sharon. I'm putting together a few more designs so that I could have a different flower for every block. A little slumber, a little sleep...Fall and Winter make good sleeping weather. Darling stitched rose! It's always a pleasure visiting your delightful blog. Blessings. Yes, the roses will be back someday. Yours is such a beauty. Cross stitch and crochet in the same piece... what a beautiful surprise! Happy weekend! Aaaah, so nice. Thanks for the poem. Have a good evening. Aaah, such a beautiful rose, it looks lovely on your crochet, and will be sweet as either a cushion or throw! I've never seen cross stitch done like that....it's beautiful! Makes me want to pick it up and touch it! Enjoy your weekend! So pretty....and I'm already dreaming of spring, LOL. along with your sweet story prose. I love that you always leave rhyming comments, dear Gracie. Such a beautiful project, the cross stitch rose was a delight. Encouraging words from the wise tree. Beautiful! And I know just how the rose feels, there are times when I just don't want to go to bed and sleep. Go to bed and read, yes. Love reading in bed as well! I'm just reading the new book in the Darling Dahlias mystery series, one of my favorites. Lovely! Already dreaming of flowers and blooms next spring! A beautiful poem and really lovely work, Amalia! Oh my you did a beautiful job with cross-stitching on the crocheted piece, my mom use to do this but I have never tried it. Poor rose, I didn't summer and fall to end either. That's a very sweet poem that I should take outside and read to my roses. They insist on blooming even as their leaves yellow and fall off, and the rains drench them. Such a pretty piece of cross stitch. I hope you have a lovely week. Beautiful poem and such delicate work! Sweet brave little flower ... the last rose of summer! I am catching up on blog reading this morning. I have no idea how I missed this treasure. I love roses and cross stitch. They are perfection on this piece of crochet. What a wonderful idea! And that poem...I still have a few roses trying to bloom and grow new growth. I think they may get told tonight to stop. Your cross-stitch rose is so lovely and it's perfect! Love my roses in our garden, can't wait for Spring to see them again. Have a great week Amalia! So pretty Amalia! Your work (stitching and poetry) is beautiful! Have a great one! Love and hugs! I did enjoy your poem, and I thought your stitching and crochet looked lovely. Enjoy these last days of November, the month seems to have gone by so quickly! So pretty! Hmmm, what will you make with it? Finally decided on a cushion. This is lovely! And what a great idea to cross stitch on top of crochet. Precious poem … reminds me of little children who insist they aren't sleepy, and yet can barely keep their eyes open! Lindo poema, adorei o bordado. Oh this is really so beautiful and sweet poem dear amalia!!!!!!!!!!!!!!!!!!!!!!!!!!!!!!!!!!!!!!!!!!!!!!!!!!!!! happy thanksgiving my friend! stay happy and blessed! You always leave such sweet, generous comments, dear Baili, they warm my heart. Amo suas composições! Não só de linhas mas de palavras. É sempre um prazer te ler. Your poem made me smile. I do remember how there was always a flower that lingered until it was frozen from the cold when we lived in New Hampshire. yes, next couple months will be spring. I've not tried this style of embroidery on crochet for a while, you've made me want to give it another go. Great minds think alike - I love your pink rose, thank you for visiting my 'last rose of summer' post with a little pink rose! Beautiful poem and wow I love the embroidery on a crochet bed, I've never seen that before! That's a sweet poem. I don't think of roses sleeping during the winter since they bloom throughout the year here in California. I feel bad that our roses may be working overtime. That is so beautifully worked. I have a cotton pullover with knitted roses. But they are simply one green and one red. Oh Amalia, what a stunning post! The words are ever so precious and the rose is beautiful! A pretty cross-stitch for a pretty poem! We're barrelling towards winter so I sympathize towards the rose! It’s always a great pleasure to visit your Blog, to read your poems and see your art! Dear Amalia, thank you too for your nice comment! Wow, Amalia, your crochet and stitching are flawless! And your poem made me dream and smile once more. Thanks for joining the weekly linkup at http://image-in-ing.blogspot.com. The new one for this week opens soon, and we hope to see you once again! Lovely! Thanks for sharing with us at the To Grandma's house we go link party, see you next week! Your cross stitch rose is so pretty. You know how much I love roses. And they are the sturdiest flowers. They survive in really cold weather and really warm weather. They go way back in time, and they are beautiful. Very pretty, and interesting to see a different technique. I have not seen cross stitch done on crochet before. Thanks for joining in my Ginx Woolly Linx Party. So beautiful! What talent you have and your poetry warms my heart on this cold winter's day~ Blessings to you in this New Year. Happy January 1st!